Watch for it's November release! 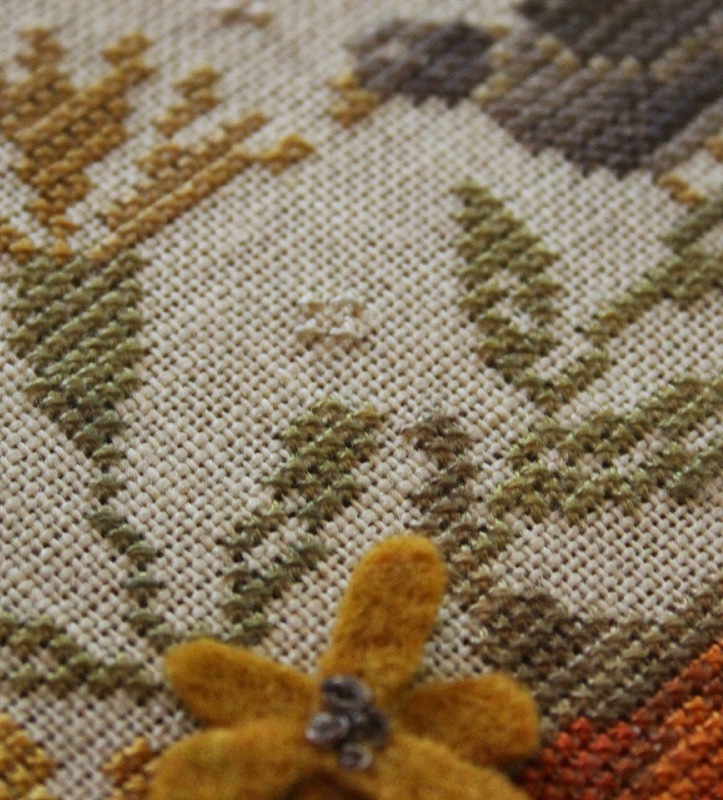 Thanks to all who have voiced your punch needle preference on my side bar, tis much appreciated! 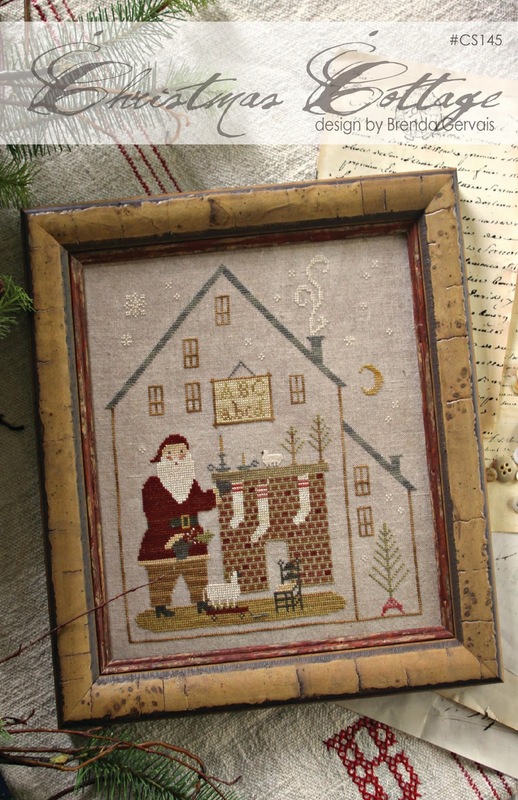 When that happens I gravitate towards punch needle design work. 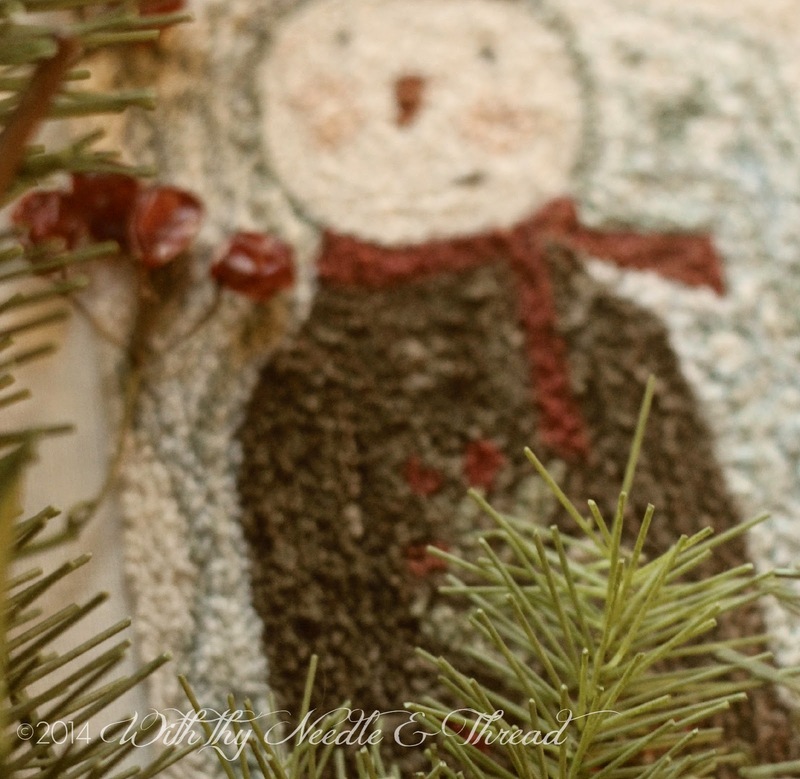 I'm sharing a couple of peeks of two of three future holiday-themed releases. The third is just ready to go into my hoop. Hint - think ivory celluloid reindeer from the 1950-60's. 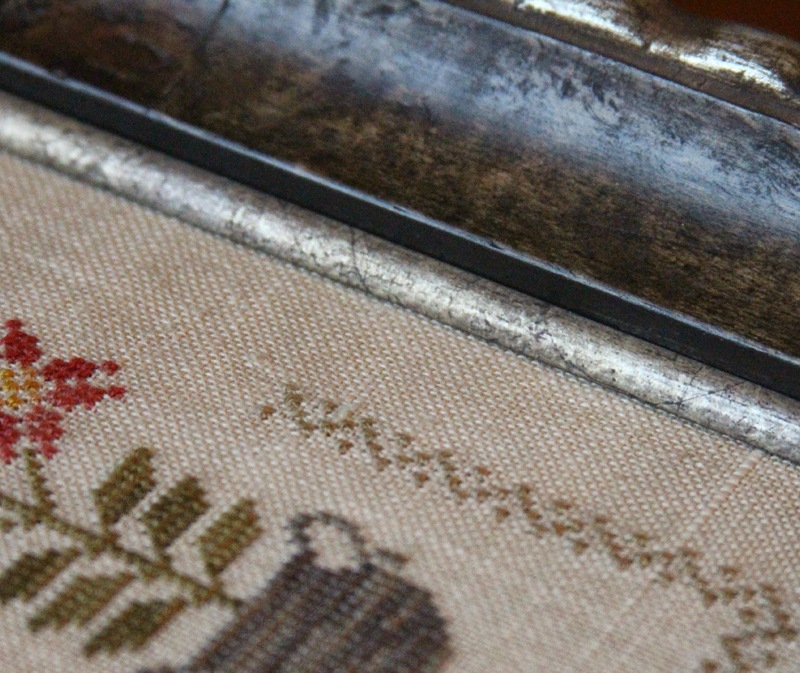 Punch needle...almost instant gratification and finish is always much closer in sight. I'd like your opinions please. no back orders on sold out colors. 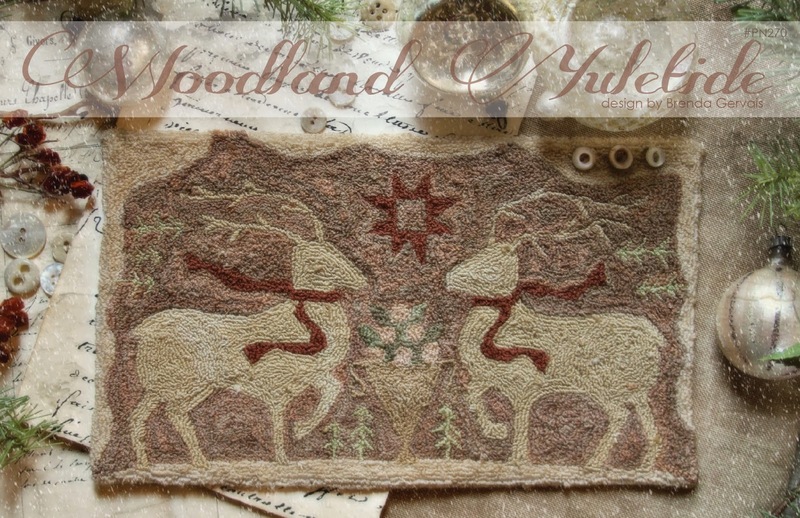 Happy to share with you a new pattern release! 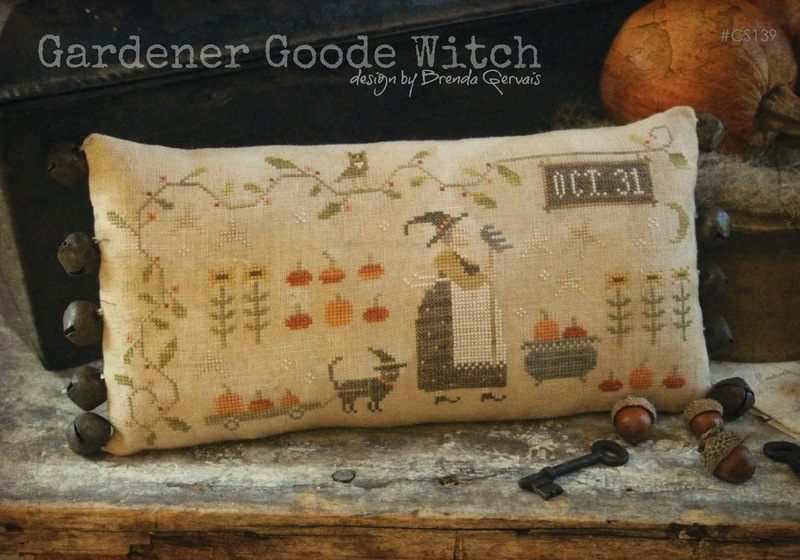 The Halloween design, Gardener Goode Witch was so well received that I decided to build on the idea and bring you a Christmas version of the design. 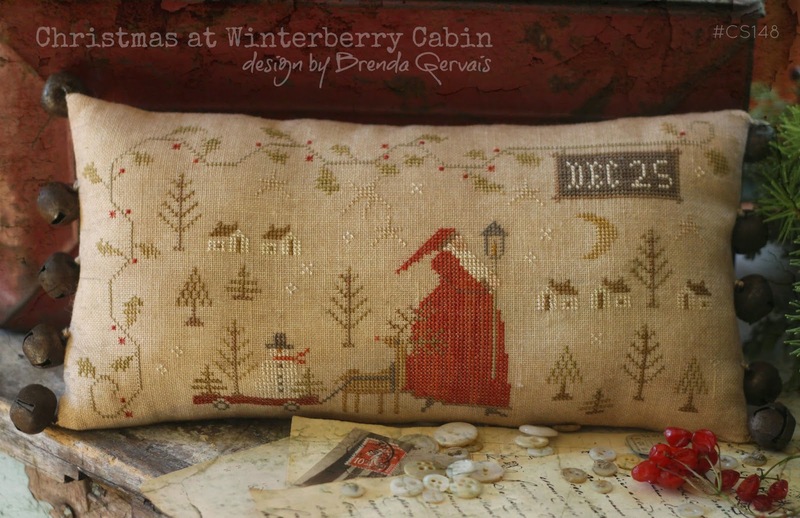 Christmas at Winterberry Cabin is worked on 32 count, color - Linen linen by Weeks Dye Works that I gently aged...directions are given in the pattern for this step. 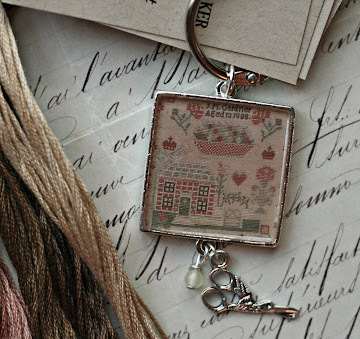 The piece is stitched in lovely hand dyed flosses over two threads. Rusty 3/4" bells get stitched to the ends of the pillow tuck for an extra special finish. It is a beautiful autumn Saturday here in NW Iowa. I am enjoying a Saturday at home. We haven't had a Saturday at home since the end of July. 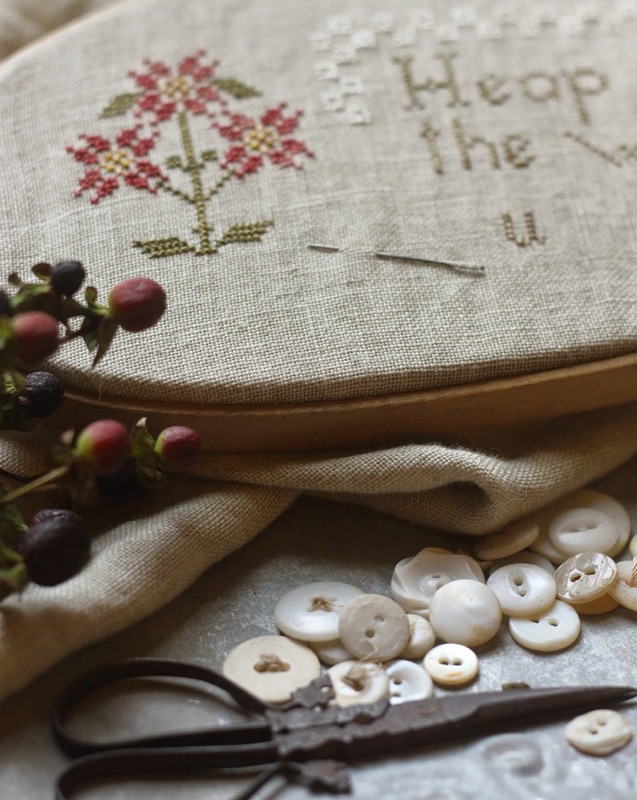 I wasn't quite sure of what to do first on the home front today as lots of things need to be done...some housekeeping, some laundry and some stitching. Multi-tasking....dont'cha love it?!! Pepita was a poor little Mexican girl. She was sad because she had no gift to share. She bent over and picked a bundle of weeds and formed a bouquet. The bouquet would be her gift. 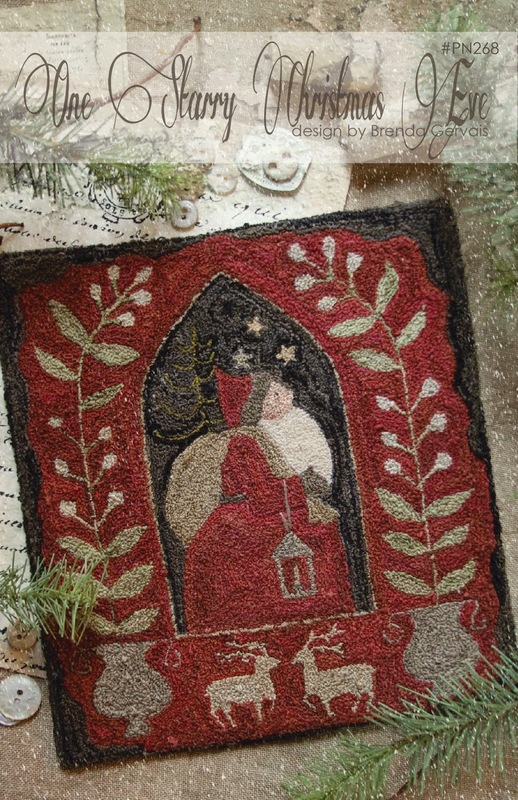 She placed the bundle of weeds at the base of a nativity scene. or "Flowers of the Holy Night"
or what we know as the Poinsettia. whose arms are filled with small gifts. It is market weekend and the following charts are making their debut there. Many of you stitched the Patriotic Poppies design, it has quickly become a best seller! 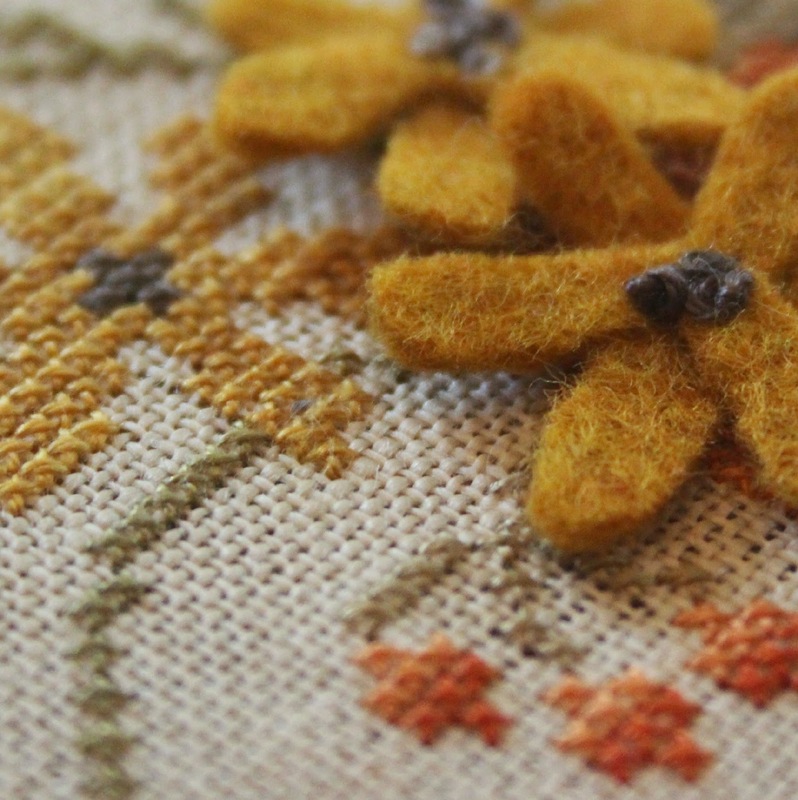 Everyone really enjoyed the little touch and texture of the dimensional wool flowers. I decided to build upon the summer sheep and create something for Halloween. The farmstead is now in celebration of Halloween! Baa-bie is pulling a pumpkin wagon that has became over-grown with Black-Eyed Susans...planted by the crows, no doubt! 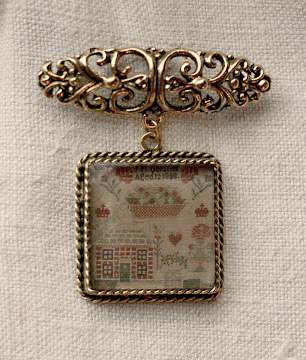 This sweet little pinkeep is about the exact same size as the Patriotic Poppies version and worked on the same 40 count Doubloon linen over two threads. getting ready for the winter months. 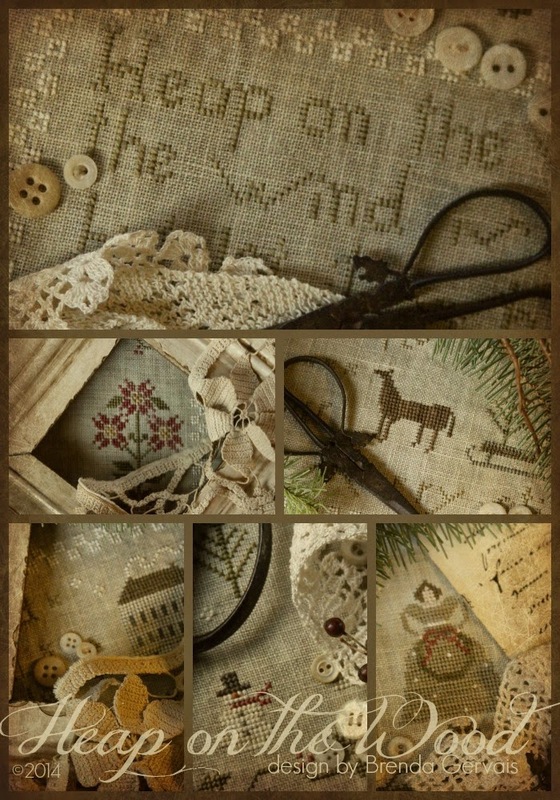 I sort of do this myself...only with my stitching goodies! to be snacked upon on a cold snowy day. 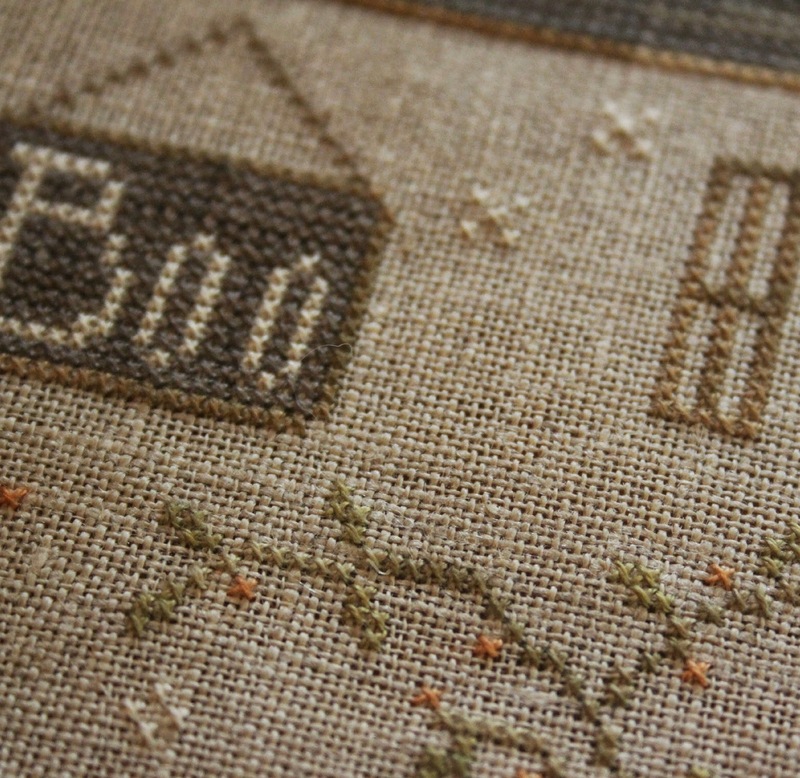 I have hidden a fun little stitching project in this pattern! 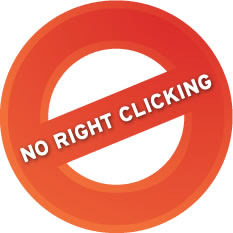 you must dig and hunt to find it!! it coordinates so sweetly with the sewing roll! 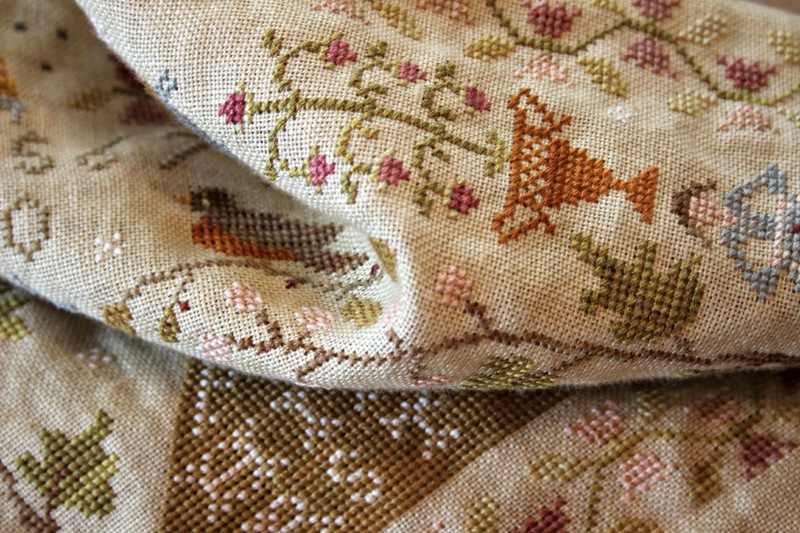 Design is stitched over two threads on the beautiful 40 count Doubloon linen by Picture This Plus. 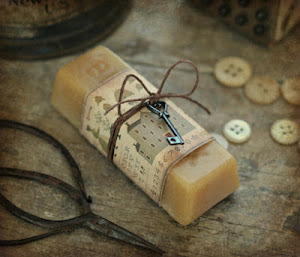 Old mother of pearl buttons and vintage seam tape ribbon adds extra detail and charm to this finish. 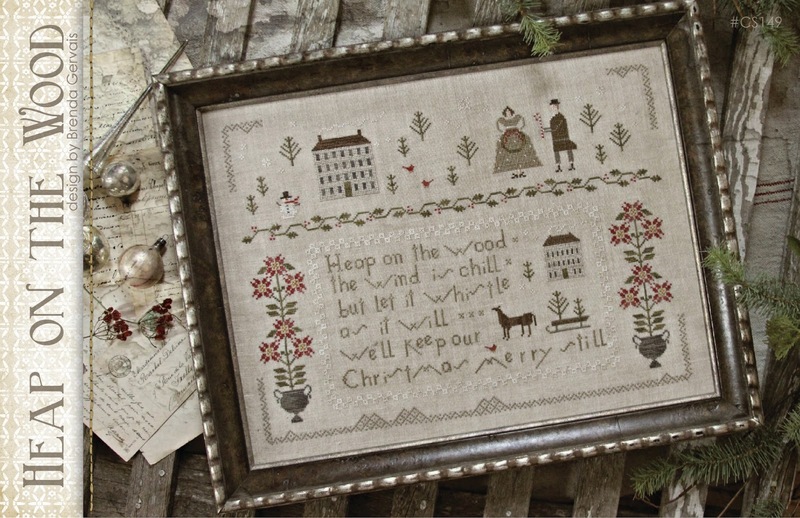 The punch needle pattern, Merry Olde Soul has now been adapted to cross stitch...had many, many request for this! 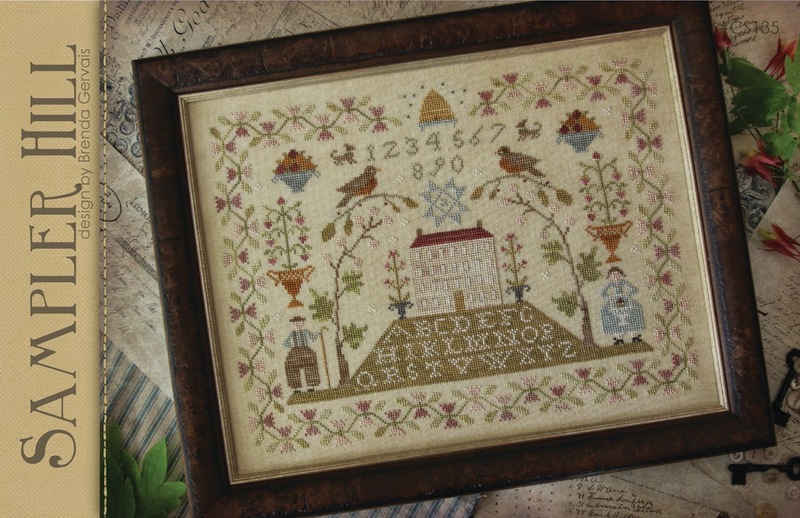 When I charted this sampler and sent if off to model stitcher, Suzanne, I had no idea how I was going to finish the piece. I wanted something more then just a frame... I decided on something a little different for a finish and LOVE how it turned out. 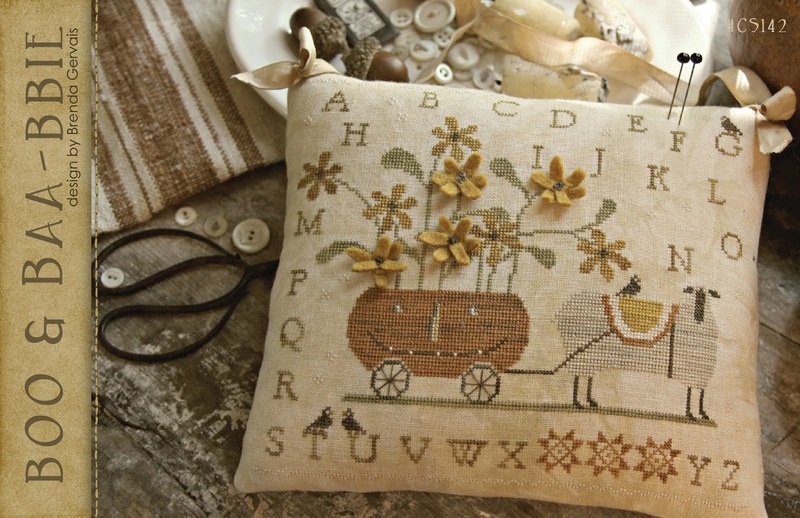 I created this into a long and narrow pocket...perfect to hang on a peg or old cupboard door. 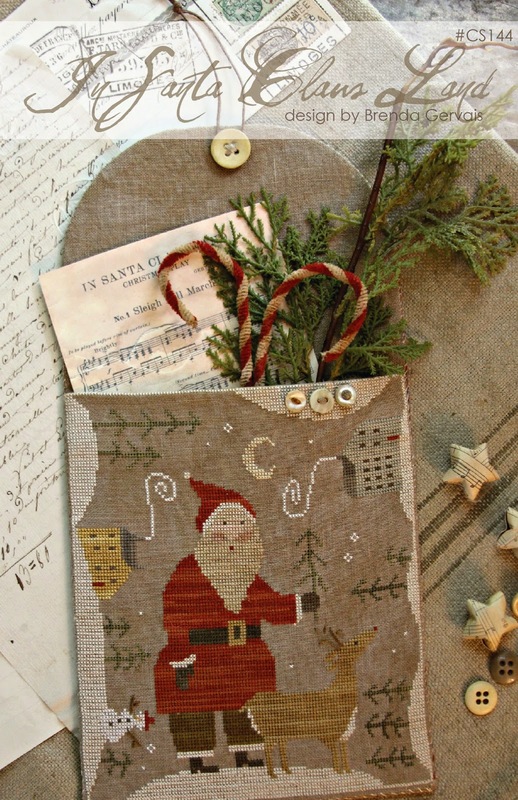 The stitched piece becomes the pocket that's gets filled with cinnamon-dusted vintage pipe cleaners, that I bent into candy canes, pine greenery and a miniature piece of sheet music...precious! 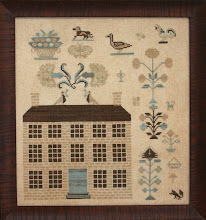 The piece is worked over two threads, on 40 count Ale linen by Picture This Plus. 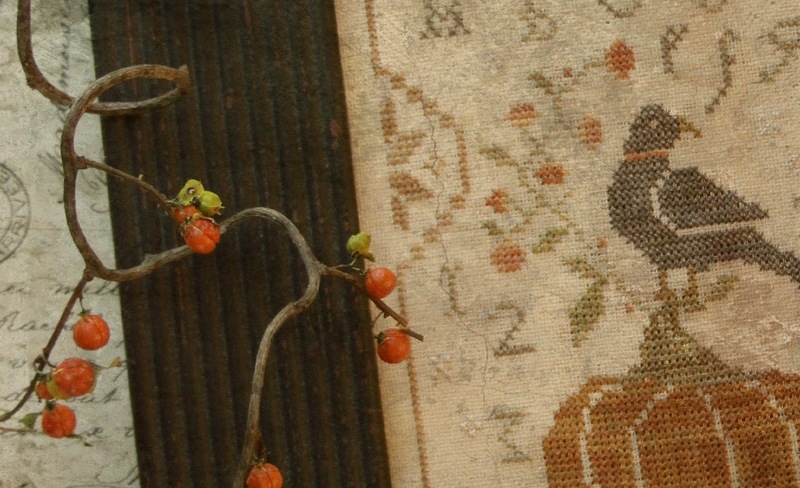 The backside is faced with red antique reproduction calico. Old buttons are stitched to the top scallop for just that perfect added touch! 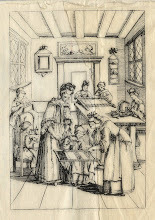 Pattern includes the miniature sheet music, too! A big shout out of "THANKS" to Suzanne Garber for stitching this model. I am forever grateful for your help and friendship. 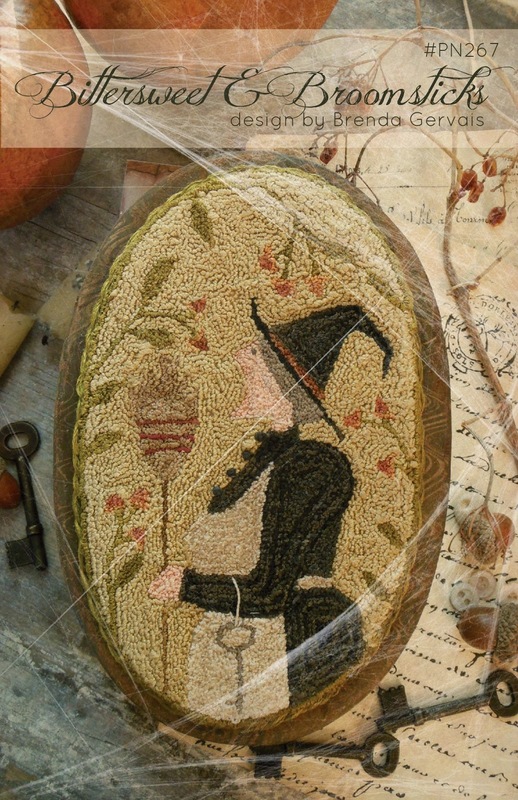 In the late July pattern releases you will find a Halloween chart titled, Hallow-day Inn...it is a pair of spooky little witches sharing a room for two at the local Hallow-day Inn. A quaint little cottage all decorated and ready for St Nick to make his appearance. 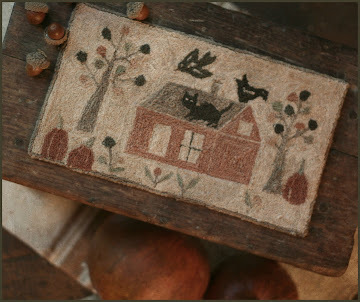 Take note of the sampler hanging above the mantel...the home of a sampler-lover, no doubt! 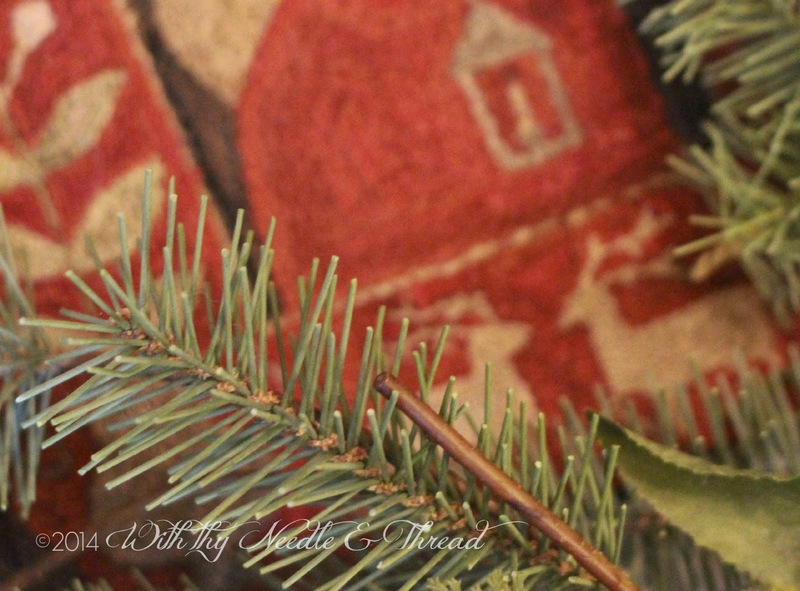 You'll find mini woolly Putz sheep, sisal trees, and old fashioned candlesticks upon the mantel and stockings just waiting to be filled. Santa has left a new doll chair and pull sheep toy for the good boys and girls. 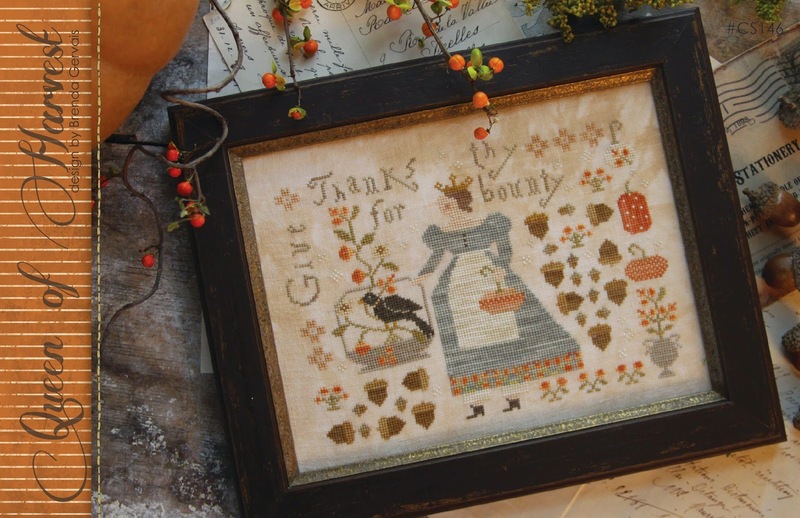 A big thank you to Susanna Baker for stitching this model. 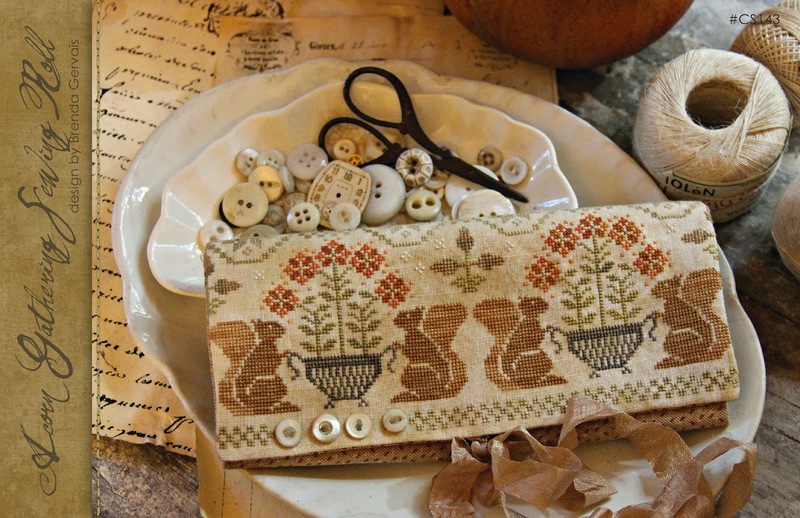 I wish my backside-stitching looked as good as yours, Susanna! 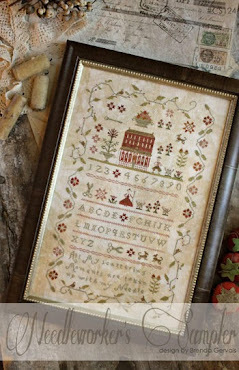 New charts, linens, and floss kits to support these new patterns are in stock and ready to ship. with the first day of school just around the corner. for the next seasons and upcoming holidays. sweet corn and fresh garden tomatoes? 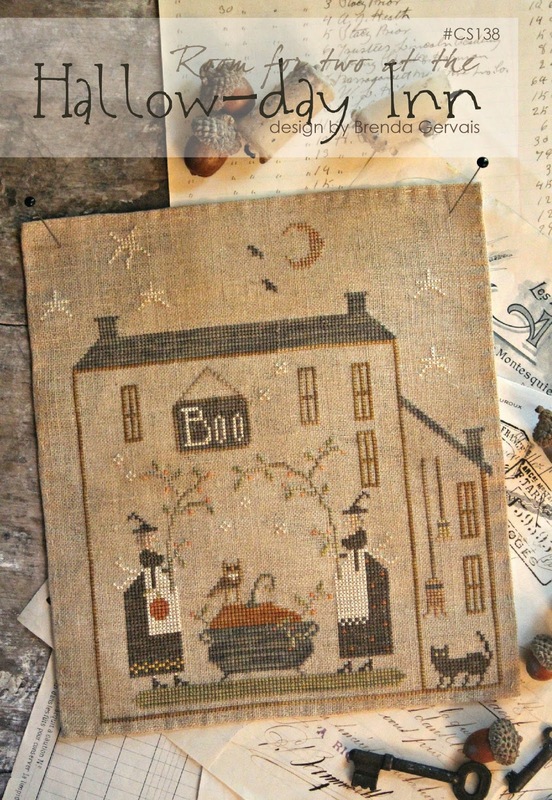 New Halloween & Everyday patterns are ready! Autumn-themed and Christmas to follow in mid-August. A fun little Halloween piece that I chose a simple finish for. Edges are just turned under and I will pin it to an old cupboard door with stick pins. This was really a fun stitch! 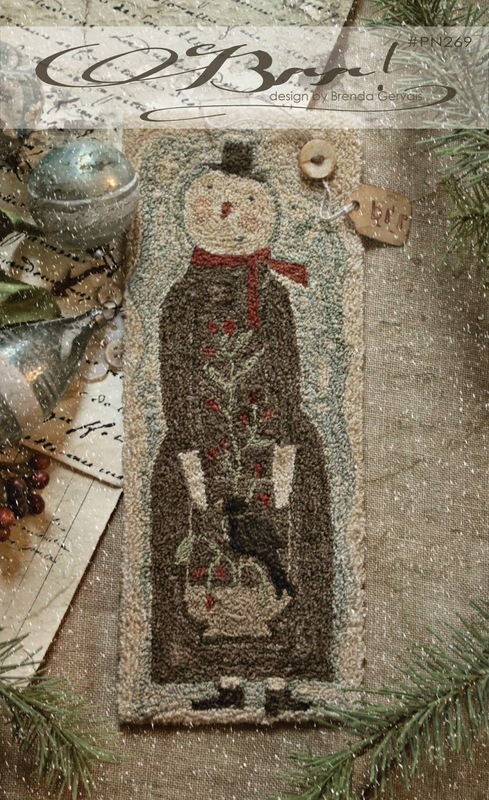 I finished this into a long & skinny pillow with rusty bells sewn to each end. 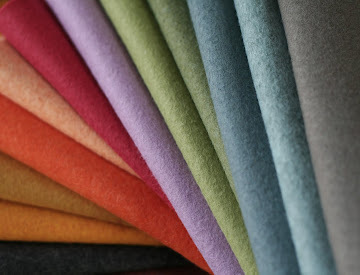 Have you tried the new count linens from Week Dye Works? 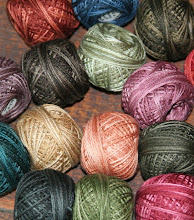 I used their 32 count, color - Linen for this piece...love the linen, it is gorgeous and has such a wonderful feel in hand. 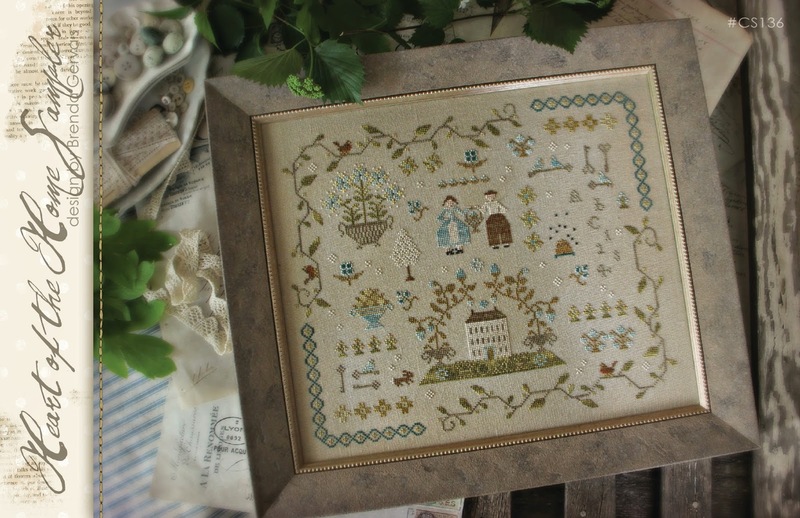 And for all you punch needle enthusiasts, a little something for you, too! 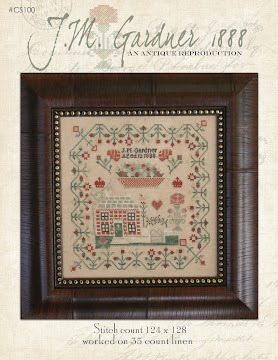 This piece coordinates very well with either new cross stitch design. I chose to mount this on a paper mache' box that I painted and finished with a hand-grained finish. 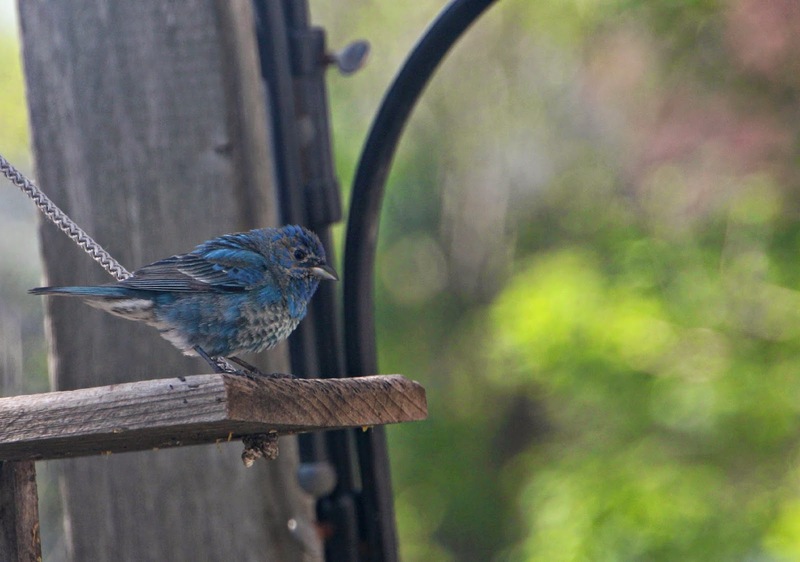 This spring I had the pleasure of being hostess to a pair of indigo buntings. 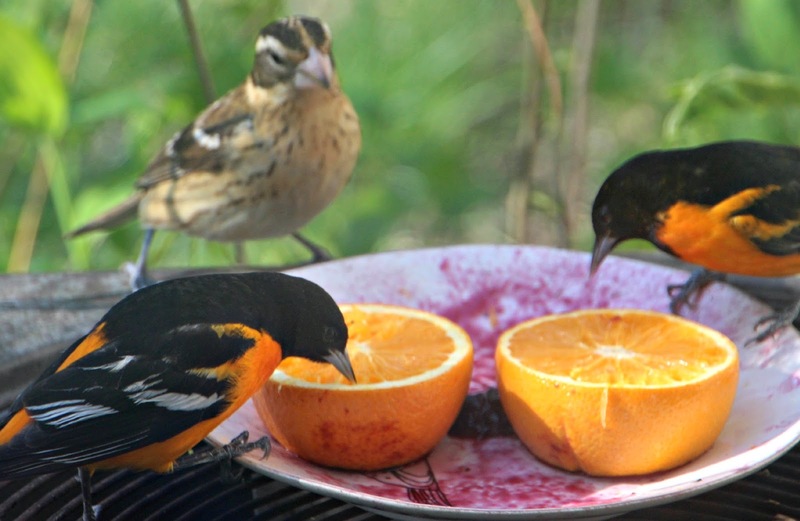 They could be found each morning nibbling on the grape jam. They were the inspiration for this design. 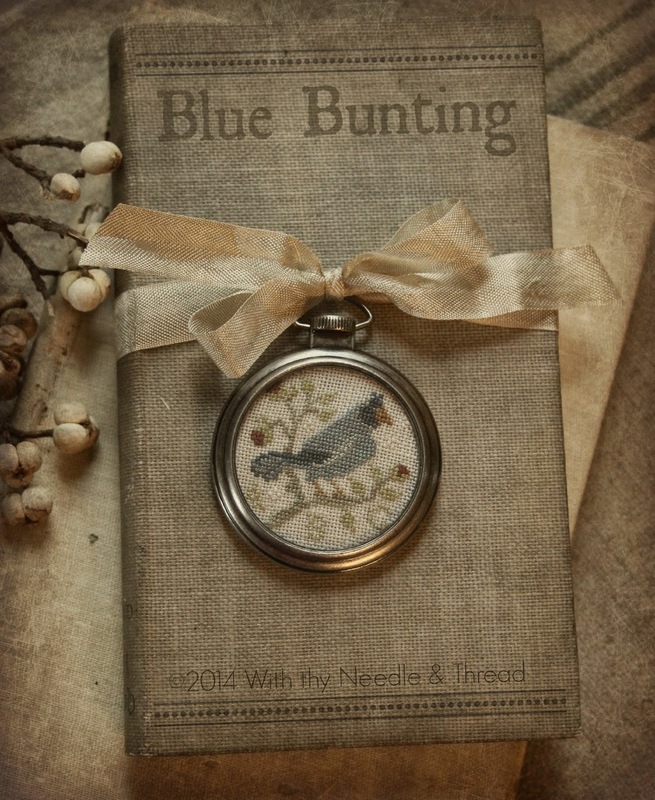 The design is worked on 32 count linen (1 over 1) I chose the pocket watch frame finish for this. 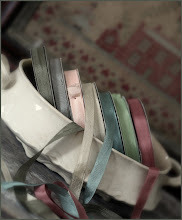 I gathered a couple of small old books and attached it with some vintage seam tape ribbon. 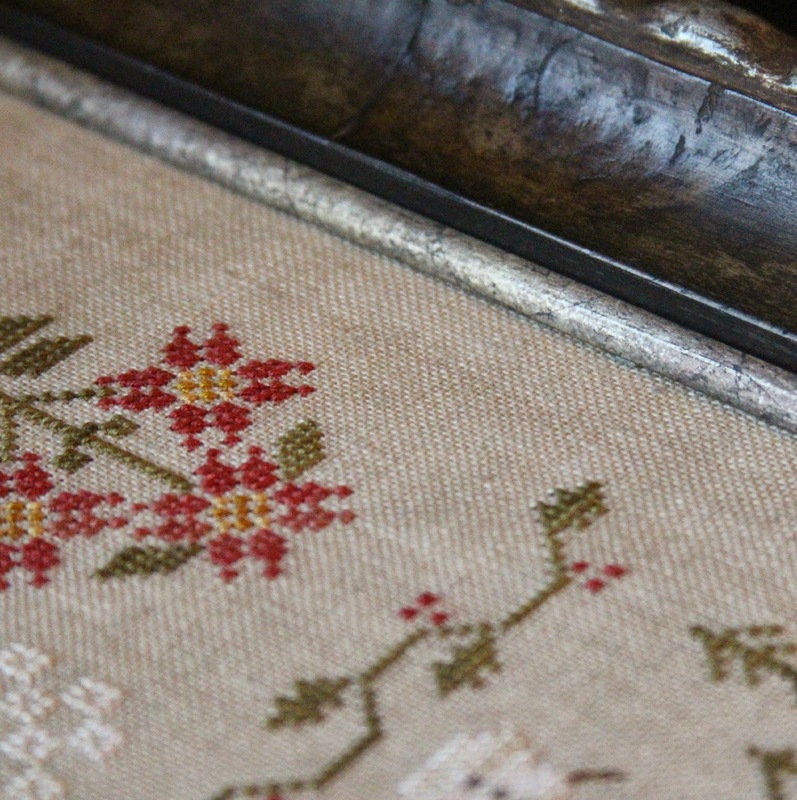 A tiny bundle of wild rose hips add just a little more detail to the finish. I love all their windows, the simplicity and clean lines of this style of home. 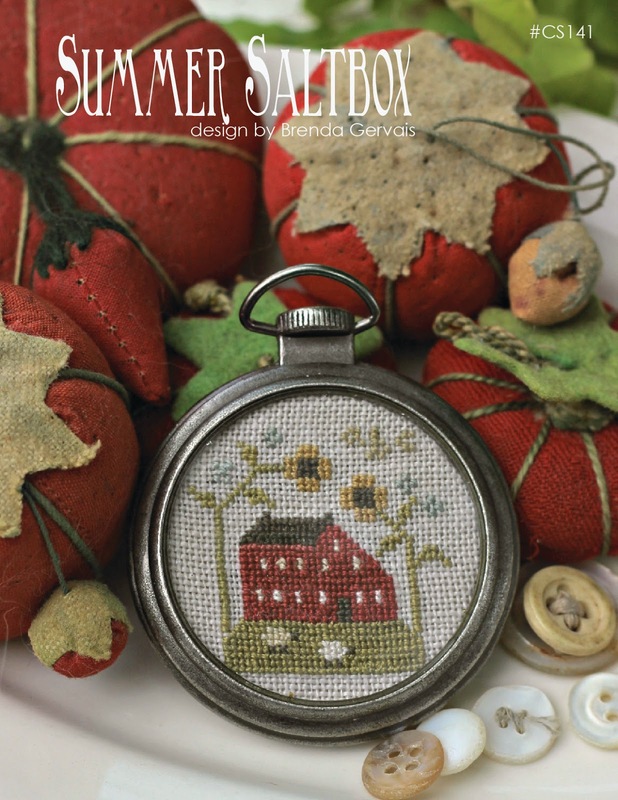 Fluffy sheep, towering sunflowers and the abc's make for a sweet little sampler. I plan to tie some hemp cording onto this piece and wear it with a chambray dress. The design is worked on 32 count (1 over 1). 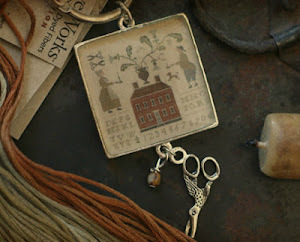 New Patterns & New Arrivals..of the feather type! 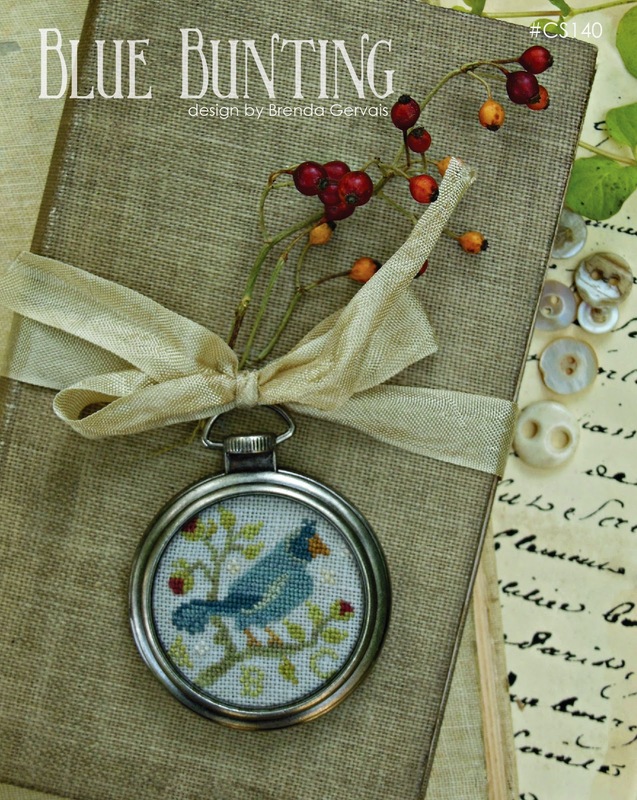 for your summer-time stitching pleasure! 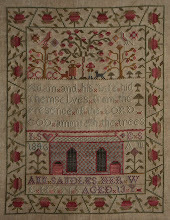 "Heart of the Home Sampler"
for their beautiful work on these two samplers. Here is momma. 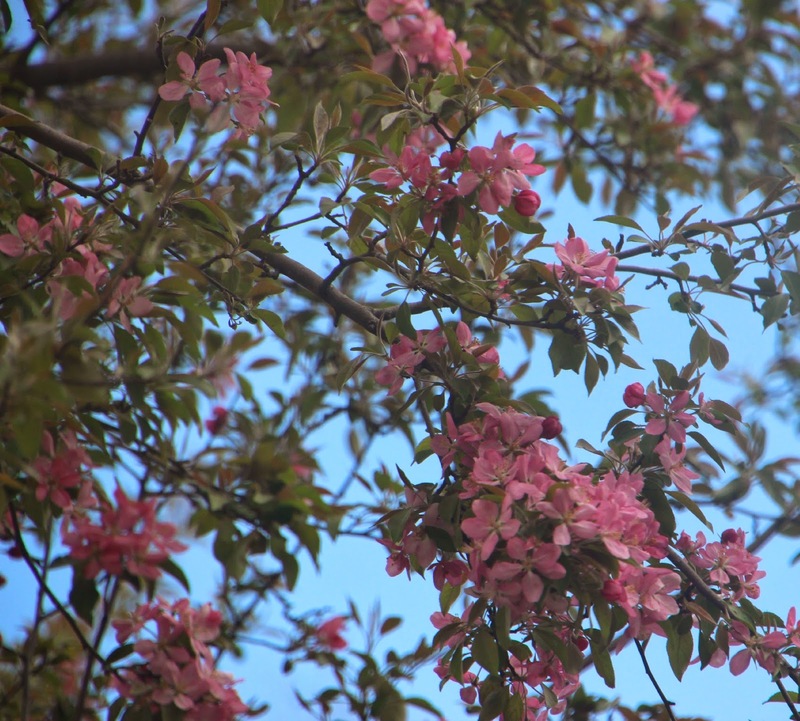 She has moved onto a diet of insects and worms and can be found most days sitting in our little red bud tree. 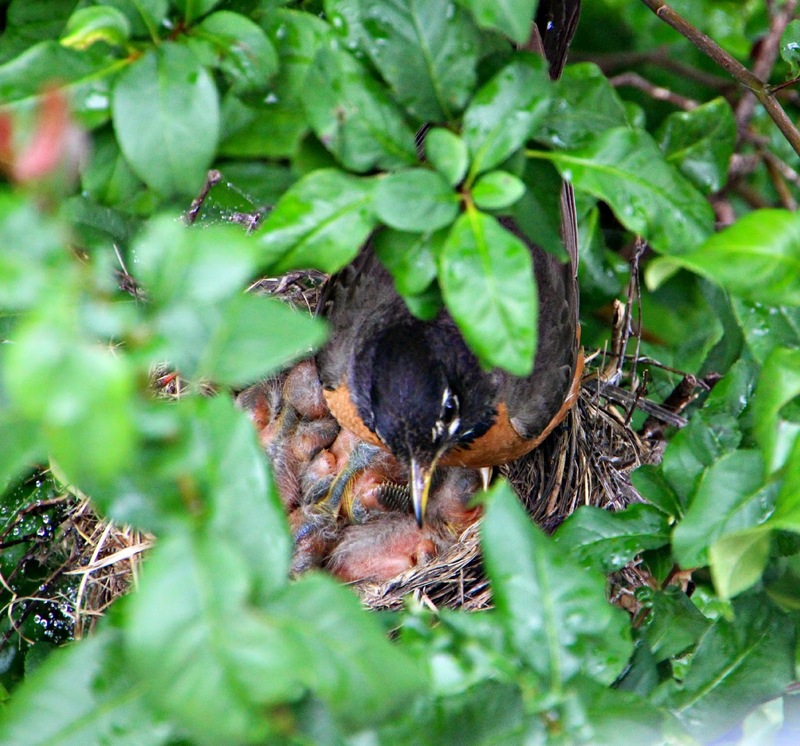 She built her nest in a little row of shrubs that hug the corner of our house. 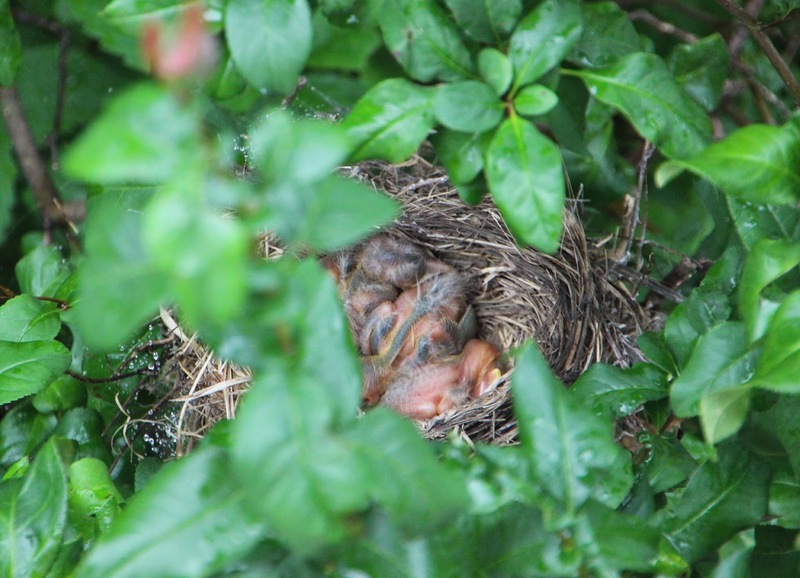 I enjoy the bird's eye view of the nest outside the bathroom window. I would like to think it is her way of saying, "thanks for all that grape jam!" 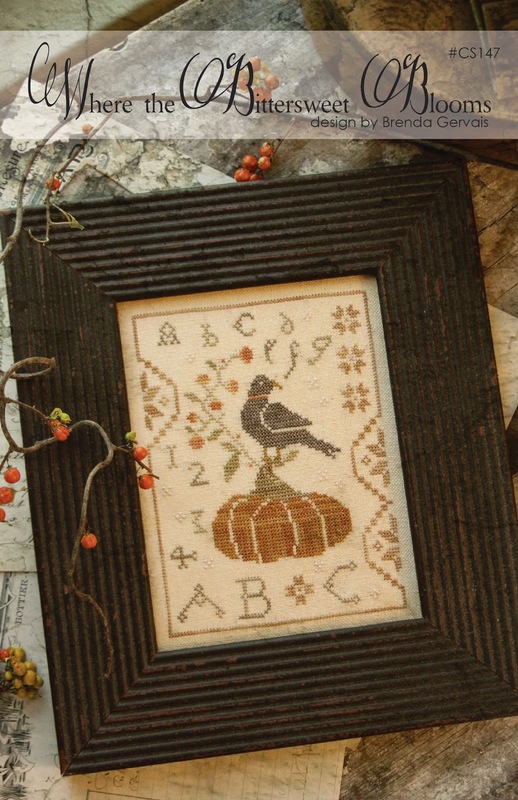 You will notice little robin motifs on the new Sampler Hill and Heart of the Home Sampler. 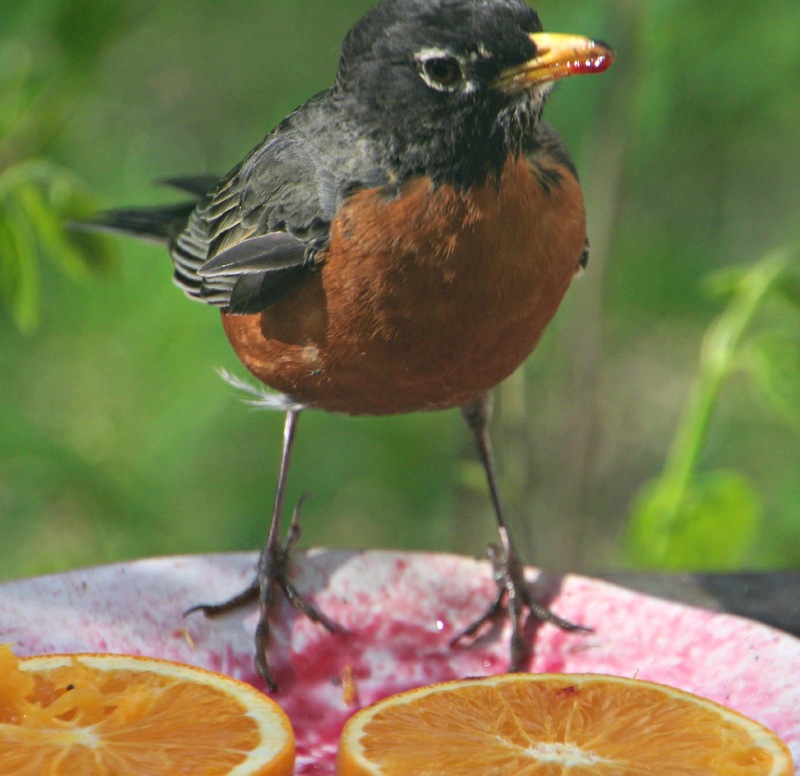 I guess you could say this robin had a little hand in my spring designs! 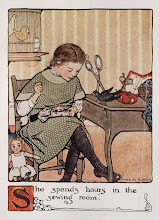 "Thank You, Robin"
Mary Jane Smallman was my January 1, 2014 start. and it took me about a month to complete. it was such a fun stitch! Mary Jane was just 7 years old. 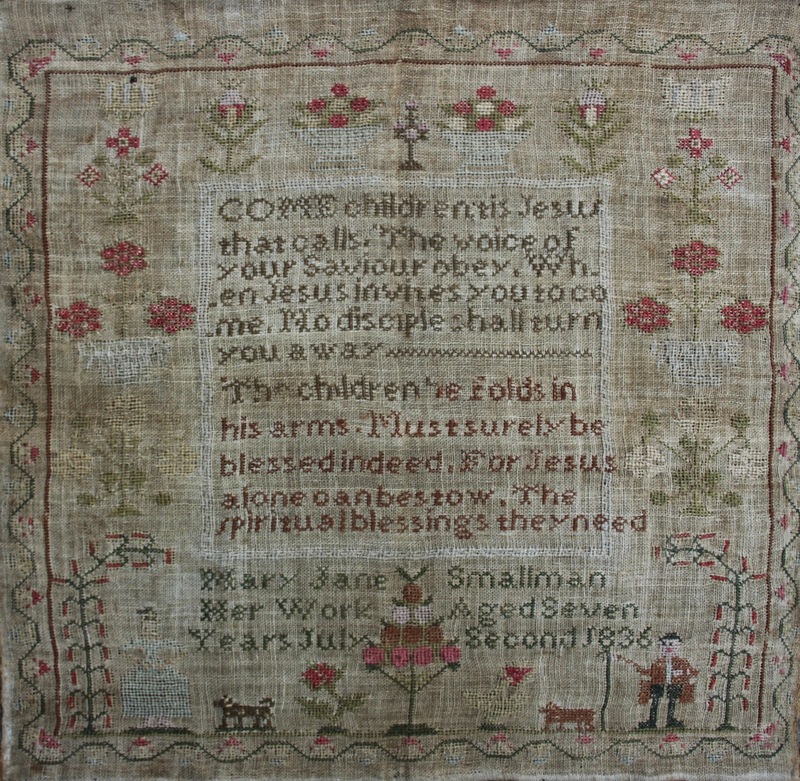 so this sampler is very dear to me. 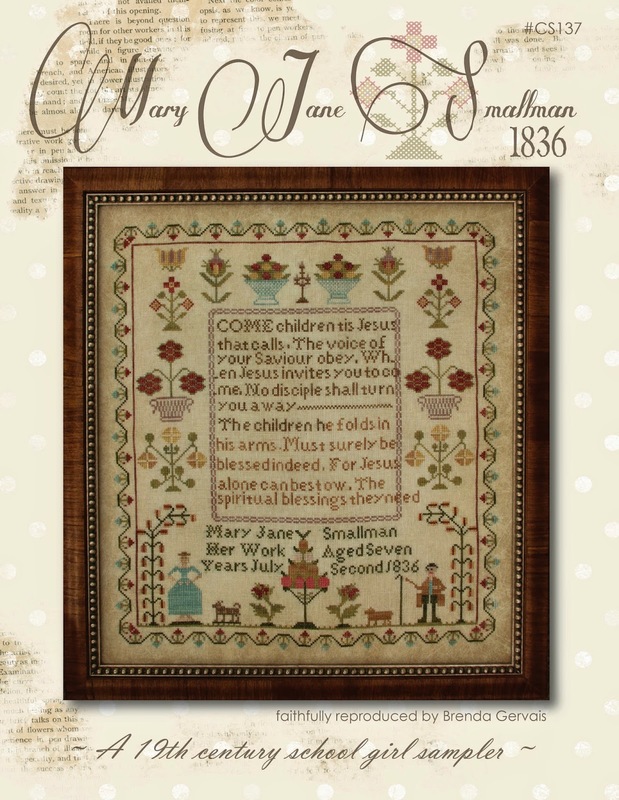 The verse was later composed into a children's hymn in 1866.
beyond the sweet little lavender chain-style border. so I felt it was perfect to leave it as is. Wishing you all a safe & happy holiday weekend, filled with family, friends & fun! 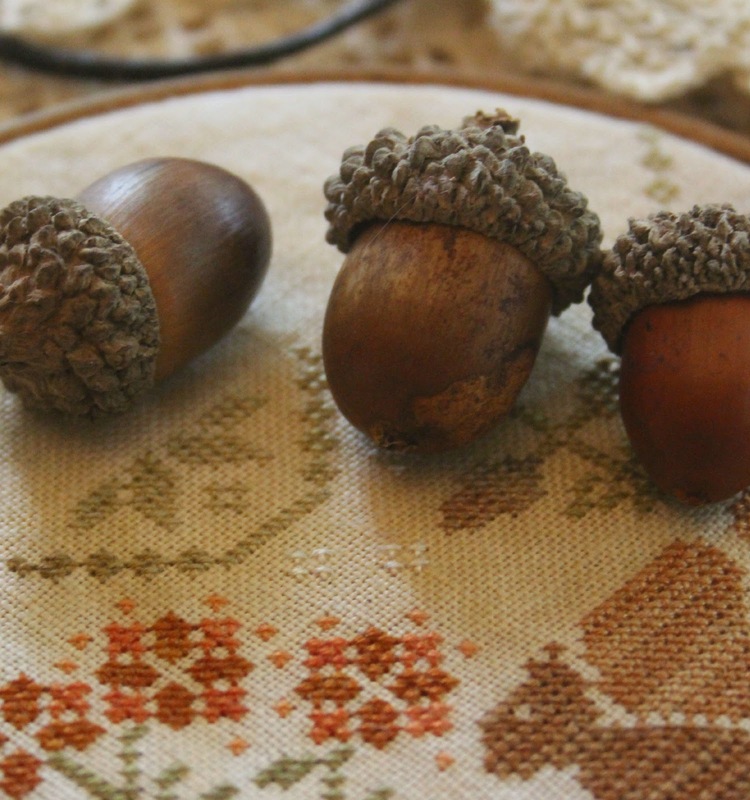 I am into full swing with my Autumn designing. Various designs are in various stages. 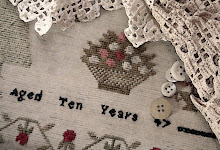 the plans are to finish this into a needle case, but that could change. I am not certain of a finish for this piece yet. she has claimed the dish as hers! but has decided to check out the jam, too. she gave it a try. Mmmm, this is pretty good stuff! There are still daily squabbles going on between the males. They are in a feeding frenzy and no one likes to share. 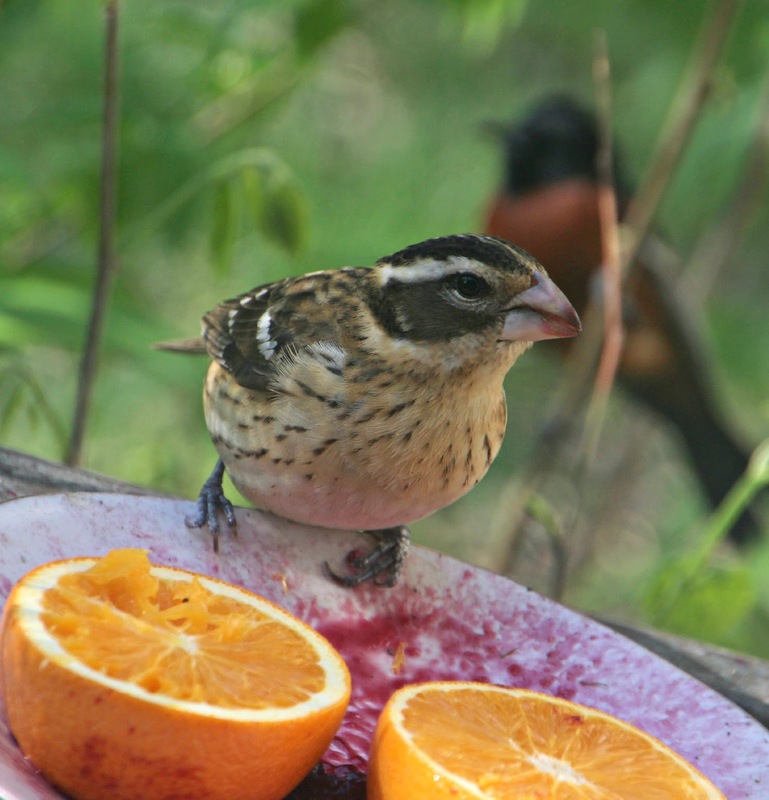 with our streets and backyards filled with 100 year old trees...so, we have lots of birds. 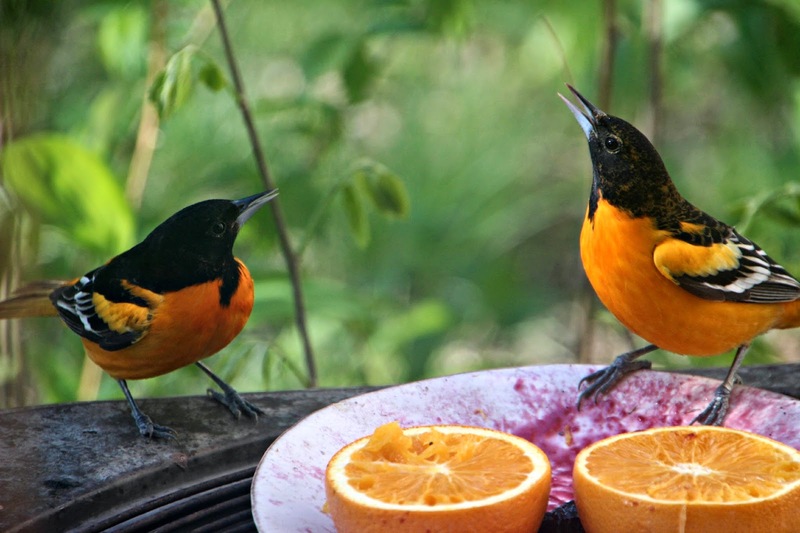 The Spring of 2014 will be remembered as the year of hungry orioles, lots of them! One of my favorite song birds. 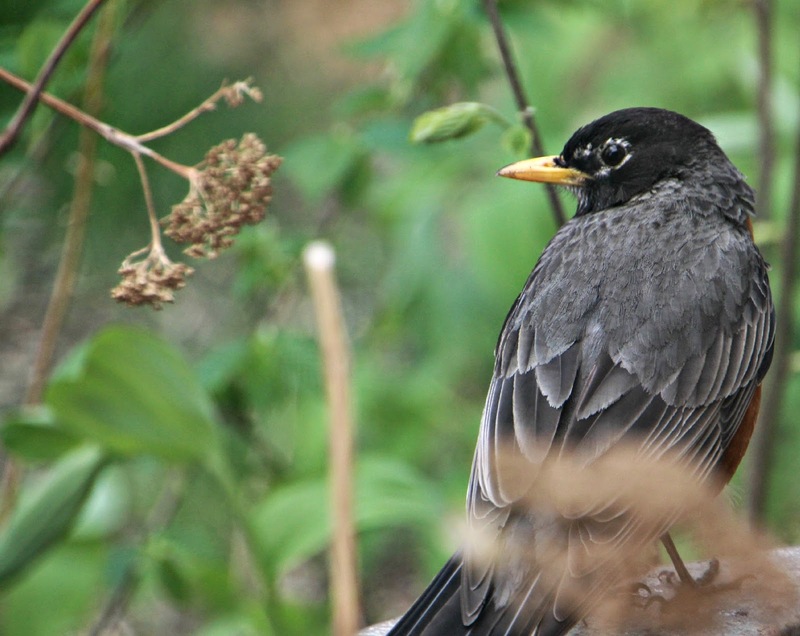 You can see his brown winter feathers are starting to turn indigo blue. His feathers will turn a brilliant iridescent blue for mating season. Isn't he the sweetest little guy? 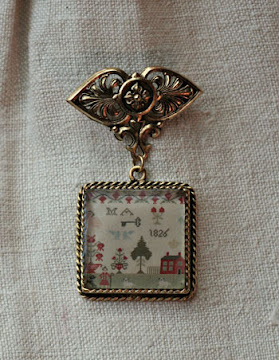 for a sweet little vignette. I nice little remembrance token of the Spring of 2014. 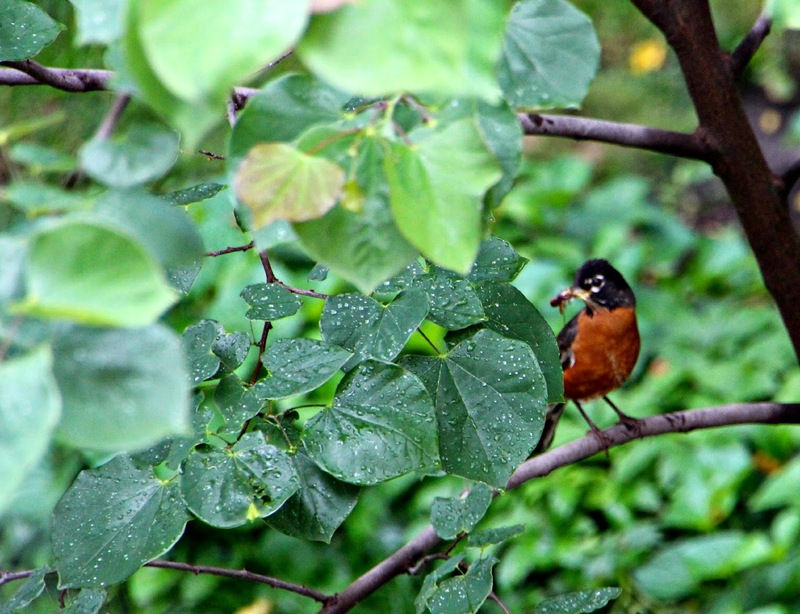 I've snapped a photo of this robin. 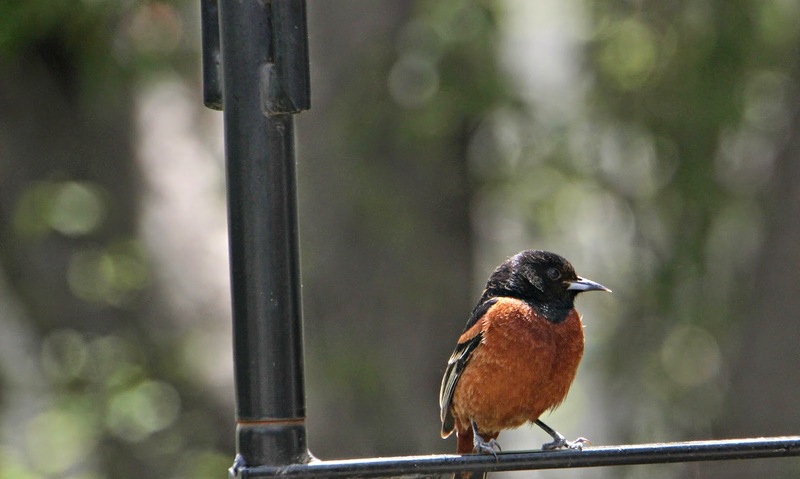 She is a sassy robin and can be found most days chasing other birds away. She likes to forage in the seed droppings on the ground. I'm not sure if she is eating seeds or finding bugs in the seed droppings, or both. She likes grape jelly, too! 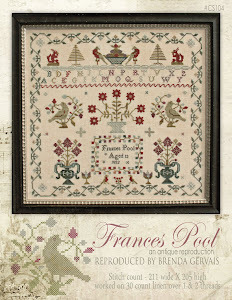 You can even find Miss Sassy Robin on this sampler. I chose lighter shades of floss for this piece. lots of old farmhouse whites and ironstone collections. waiting for a finish decision. 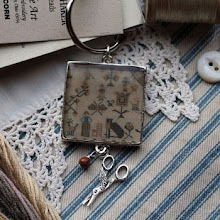 This piece is worked on the Corn husk linen and I love it! 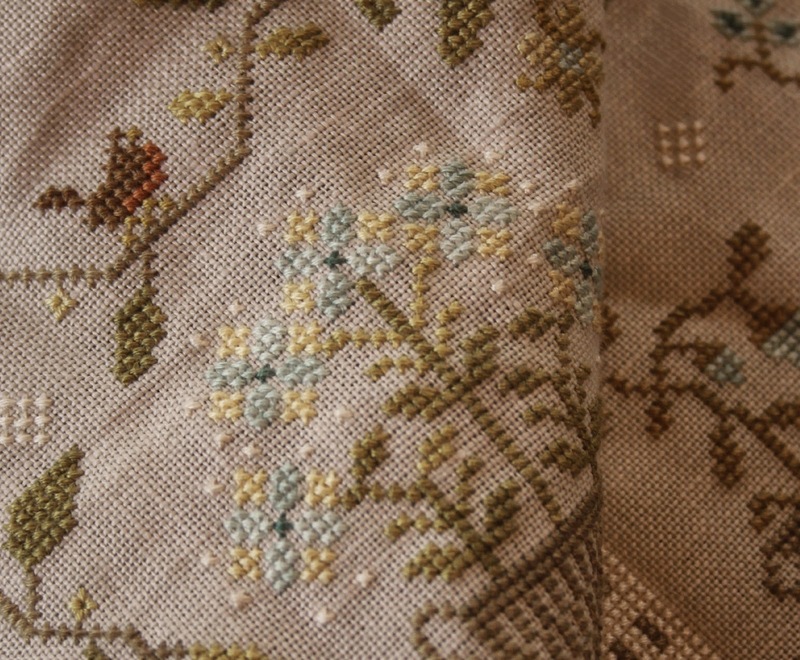 The greenish-yellow linen is a perfect canvas for the selected spring-time shades of flosses. Make it into a pillow? 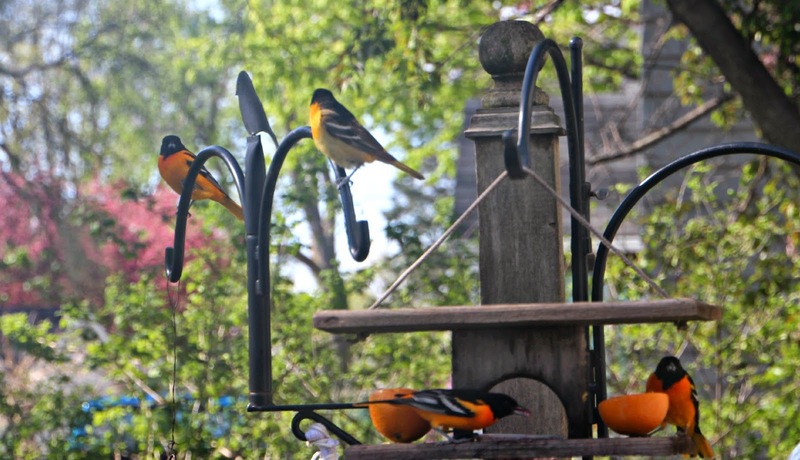 My last blog posting I showed you photos of the Baltimore Orioles. 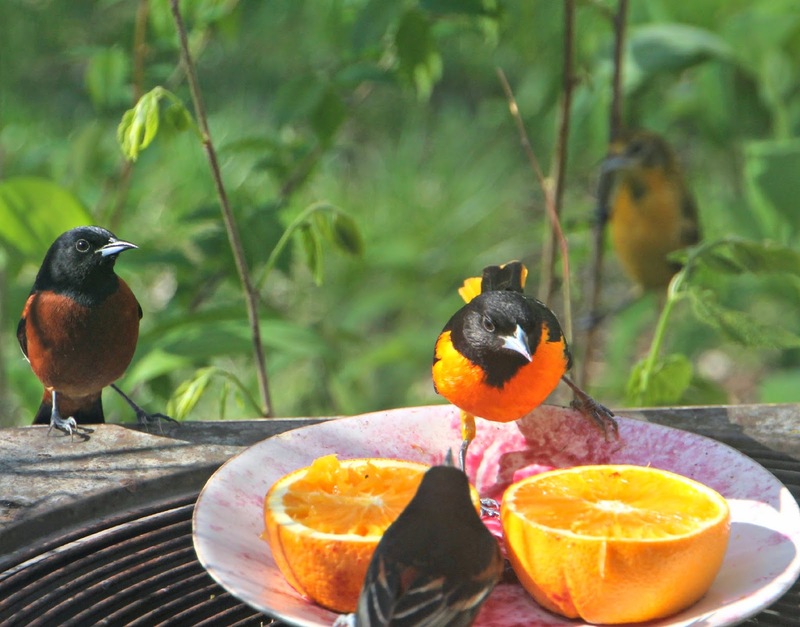 These are snaps of the Orchard Oriole. They are a deeper rusty orange and smaller in size. 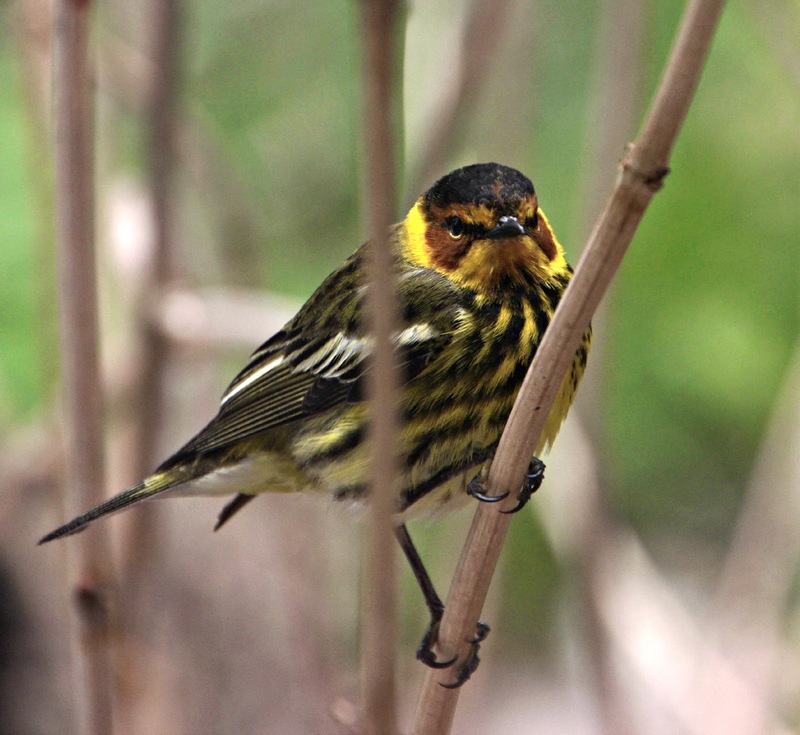 Not quite as showy as the Baltimore Oriole. 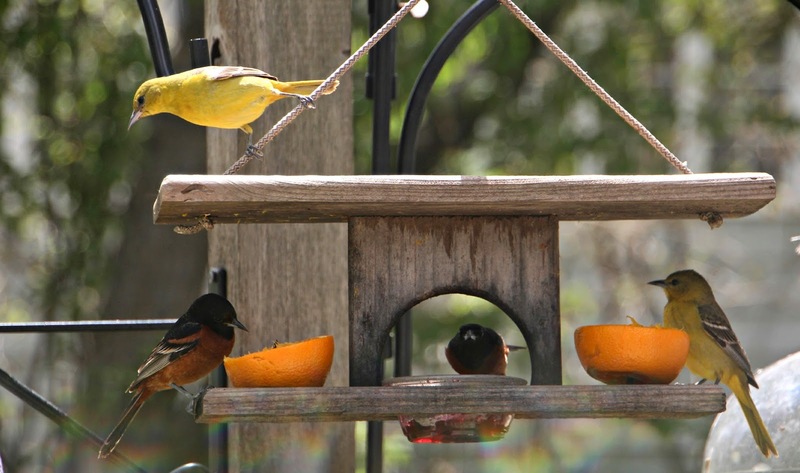 Males are rust and females are yellow. 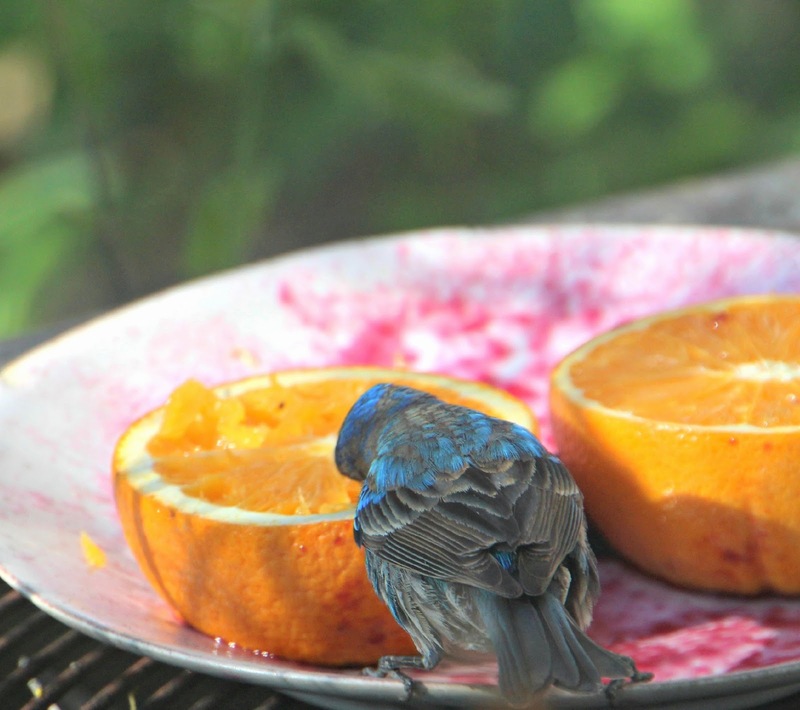 They are a very skittish, nervous, sort of bird. Any movement by my window and they are gone. and I was able to snap a couple pics yesterday. I only have seen one male and no females. 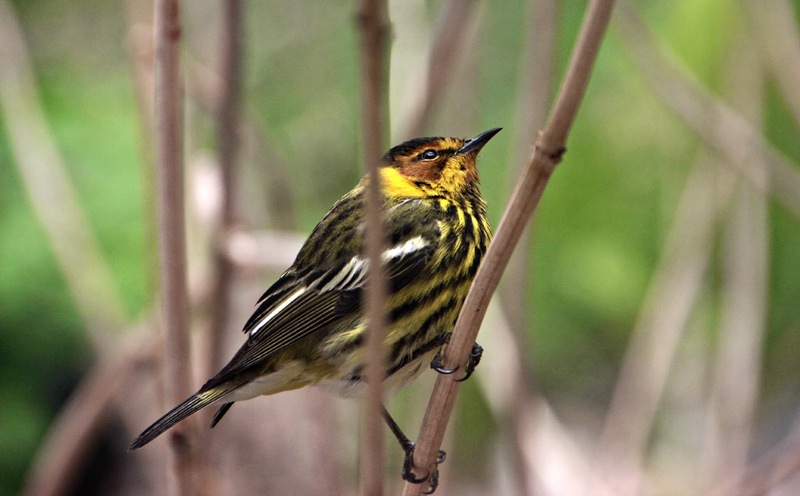 According to the book, he is off his normal migration route. He is a further west then normal. He seems content with the Orioles. 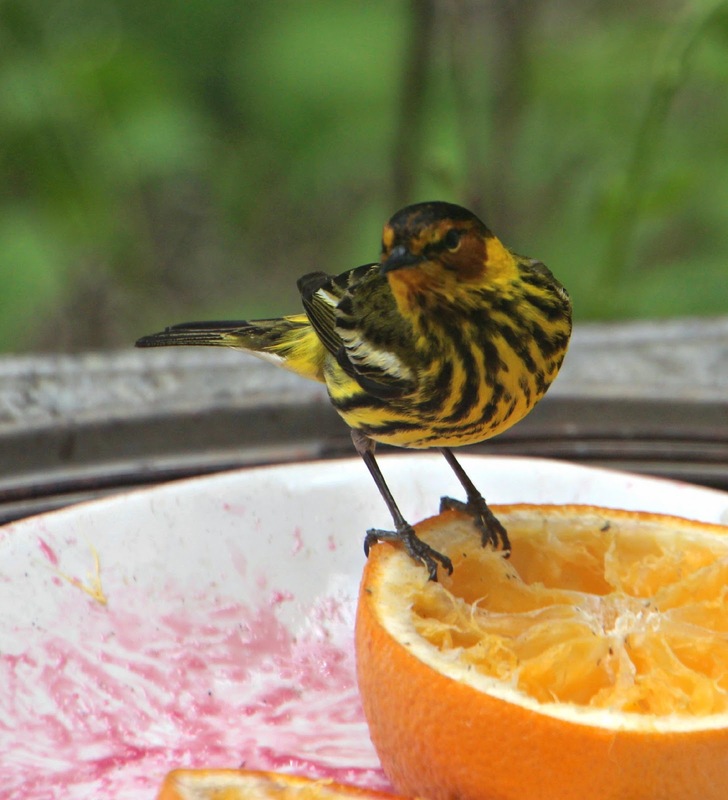 Maybe he thinks he is an Oriole! to the forest of the Northern United States and Canada. that it collects with it's unique curled, semi tubular tongue. it will feed on spruce bud worms. that he will ride further northward to it's place of nesting. Look at those delicate little bird legs!